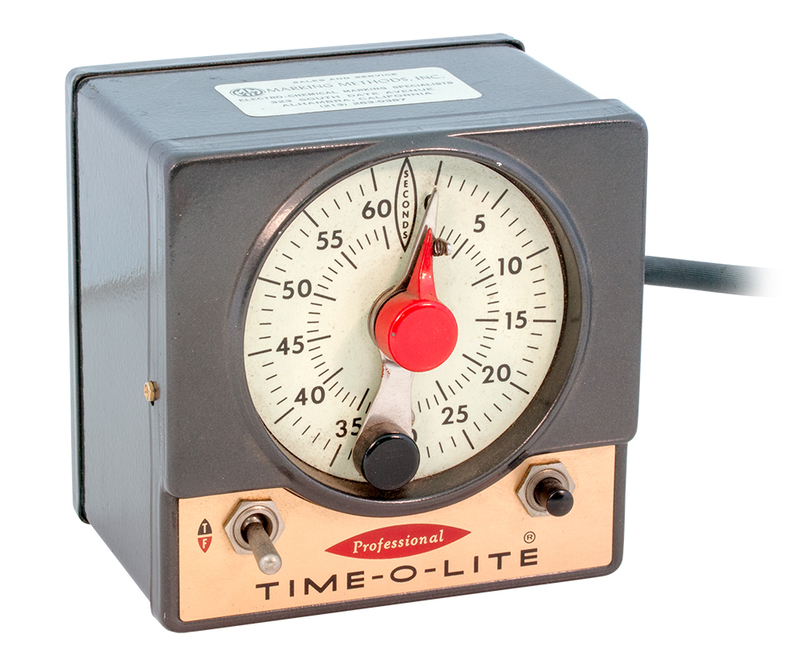 Vintage Time-O-Lite mechanical timer. AC 115v line cord in. 2 prong AC receptacle out. Manually set hand from 1 to 60 seconds. Power is applied to outlet until preset time is reached at which time power is disconnected. 5" x 5" x 4" deep. Eagle Signal "Differential Switch" cam timer. 6 minute. One shaft driven by one motor. 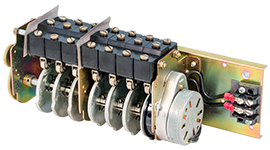 Each of 7 SPDT switches have a cam that have a 180º detent which activates each switch 50% of the time over the 6 minute rotation. Each cam can be set at any point on the shaft. 120v AC @ 60 Hz timer motor. 10 amp @ 125v / 5 amp @ 230v. 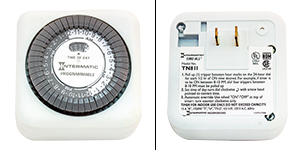 3-1/2"W x 3"H x 9-1/4"L.
Intermatic lamp and appliance timer. 24 hour. 15 amp. Up to 24 on and 24 off periods. New, clam shell. 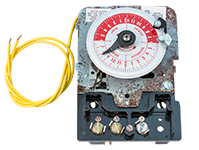 Conrac Corp. timer relay. Motor driven. Contacts: SPST, N.C., DPST, N.O., 2 amp. Time delay = 0 - 60 seconds, 115 vac motor, 45 / 65 Hz. Sealed enclosure. Three mounting studs. Eight solder hooks, glass sealed. 3.65" x 3.82" x 3.39" high. NSN: 5945-00-615-7496. A.W. 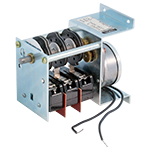 Hayden Company motor driven time delay relay. Made in 1982. 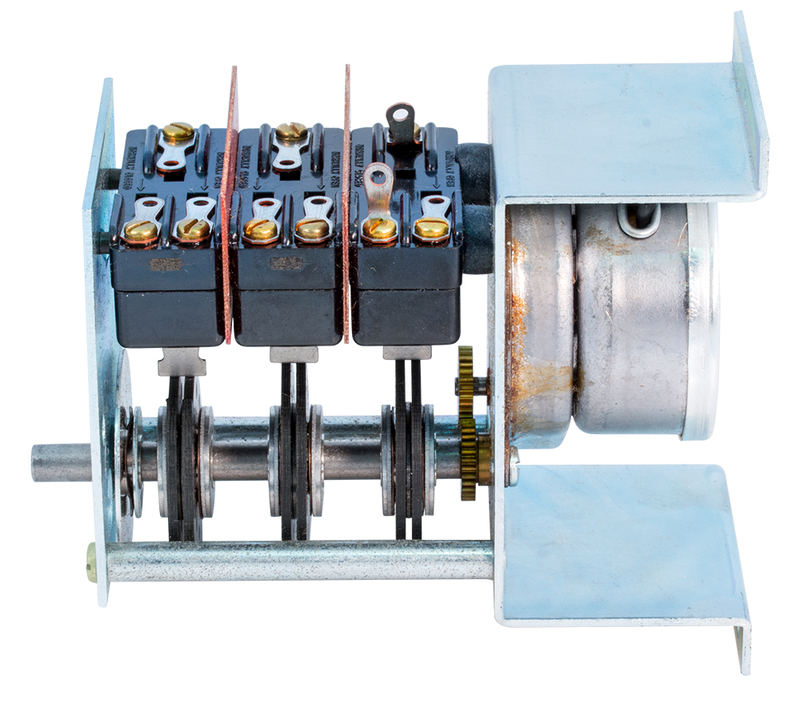 26 vdc motor voltage, 26 vdc clutch voltage. S1: 25 seconds, S2: 5 seconds. Four mounting studs, five solder eyelets. Hermetically sealed. Glass sealed terminals. Common wiper of main SPDT switch is delayed 25 seconds. Once the wiper makes the main switch, proves 5 seconds later. Contact rating is unknown. Dimensions: 2-1/4" x 3-1/2" x 4-1/2" high. NSN: 5945-00-502-4126. A.W. 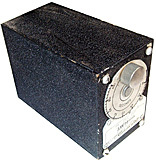 Hayden adjustable time delay relay. 15 - 90 seconds. 115v, 60Hz timer motor. 3 internal SPDT micro switches, one of which is used as end stop for motor. Used / removed. Circa: 1950's - 1960's. Dented. A.W. Hayden adjustable time delay relay same as above except 1.5 - 9 seconds. Automatic Timing & Controls step counter. 0 - 40 counts with switching at pre-set numbers. 120 vac, 60 Hz operation. 4 sets of SPDT contacts (2 delayed), 10 amp. Front dimensions: 4-1/8" x 4-1/8". Rear dimensions: 3-1/4" diameter, 4-3/4" behind panel depth. Used, removed. NOTE: We can't figure out how to make it work. Screw terminals on back. Appliance sequential timer. Low RPM timer motor with 1/4" shaft. 115 vac. Contacts: 15 amp, 125 vac, 7.5 amp, 250 vac, 50/60 Hz. 3" x 3" x 2" deep. NSN: 6645-01-242-9008. 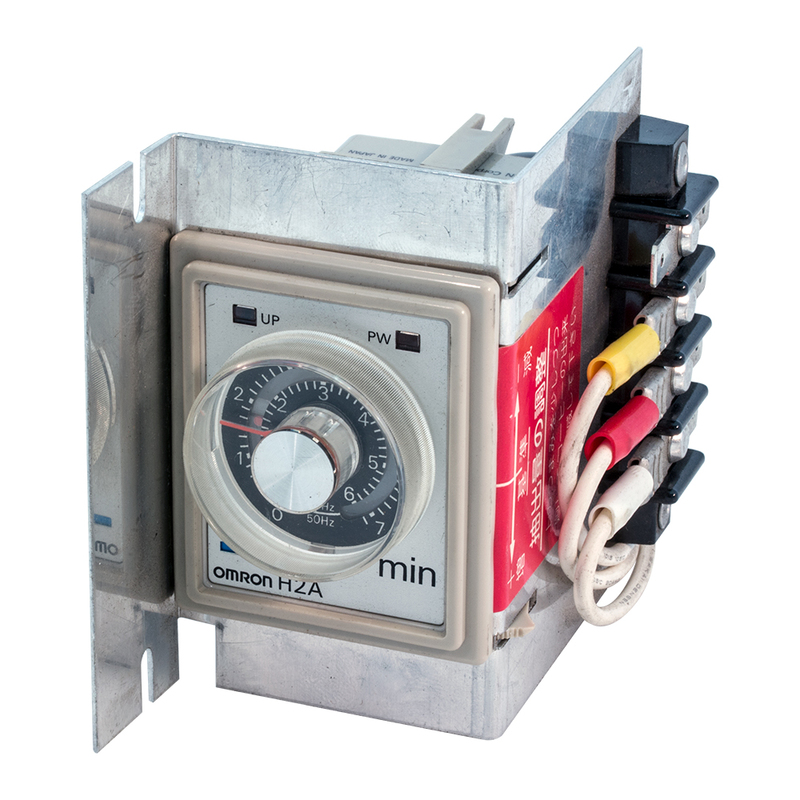 Hobart dishwasher UM-4 timer kit. 10 positions on 360º cycle. 115 vac timer motor. NSN 5930-00-329-6631. 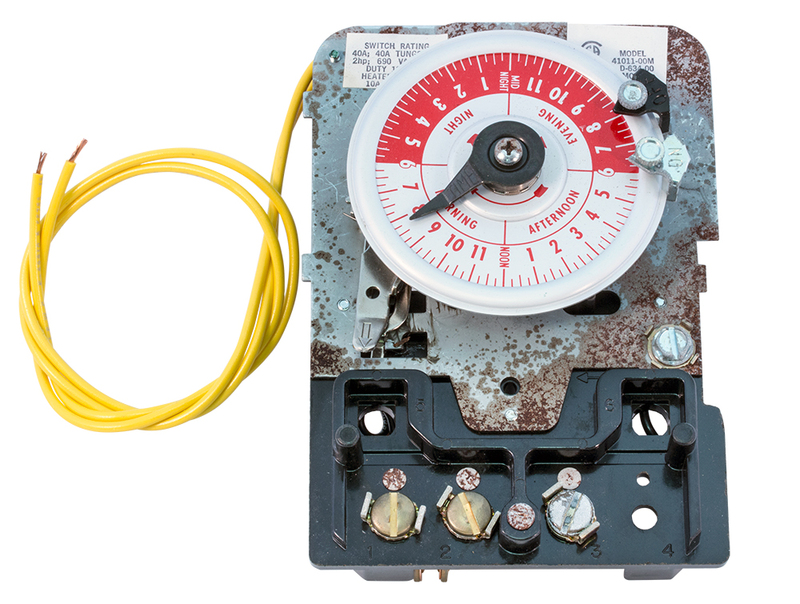 Agastat time delay relay. 10 seconds + adjustment. DPDT, 15 amp contacts. Delay on energize. 440 vac @ 60 Hz coil. Measures 4-1/2" x 2-9/16" x 2-9/16". Conrac interval timer. 4 hour cycle. 115 vac, 60 Hz. 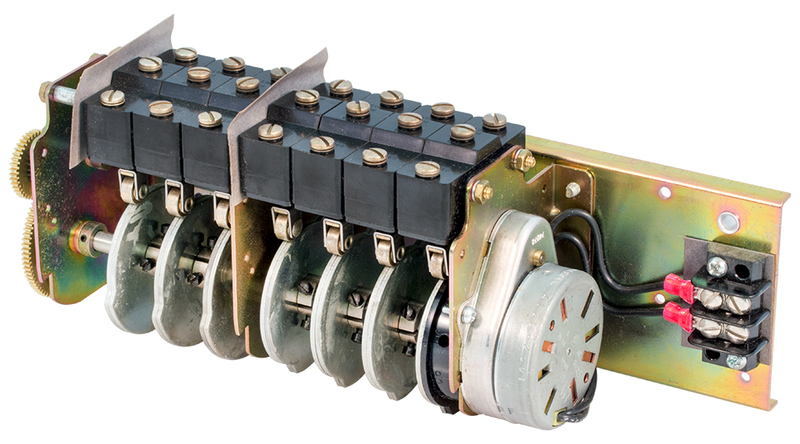 Three (3) SPDT 20 amp switches are individually adjustable on common cam. 3" x 2" x 4-1/2"H.
Allen Bradley pneumatic timing relay. 2 pole, 60 amp, 120v, 60 Hz coil. 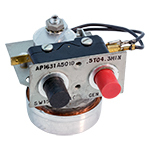 Pneumatic delay on release is adjustable from 1/20 second to 180 seconds. Nema O. Silicone rubber bellows. CSA rated. 2-3/4" x 6-1/2" base x 3" high. Regohm control element. 9 - 12 vac. SPST, normally open. 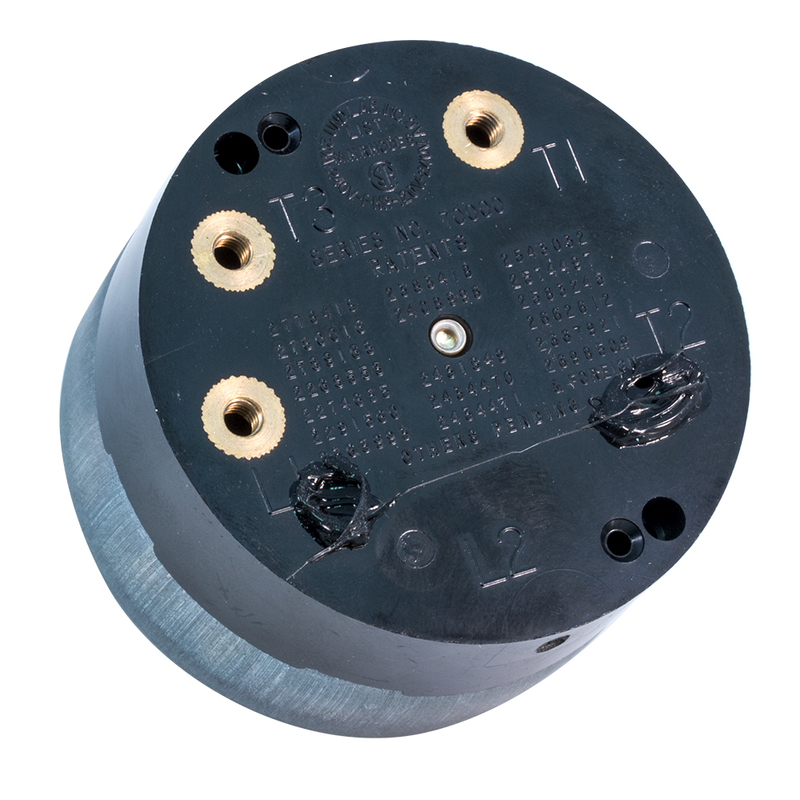 Multi-finger relay contact with adjustable contact dampener - Delay on release. 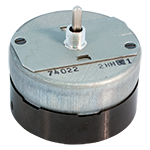 Extreme low contact resistance and high reliability. NSN: 6110-00-864-1003. Paragon Electronics time clock guts. Internal mechanism only, box not available. 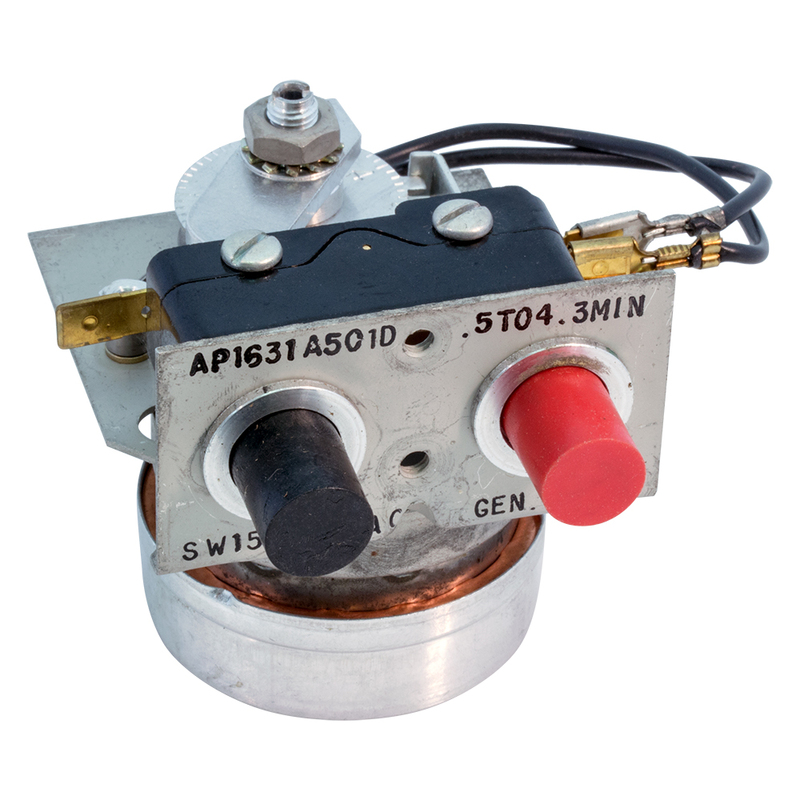 SPST, 40 amp switch. 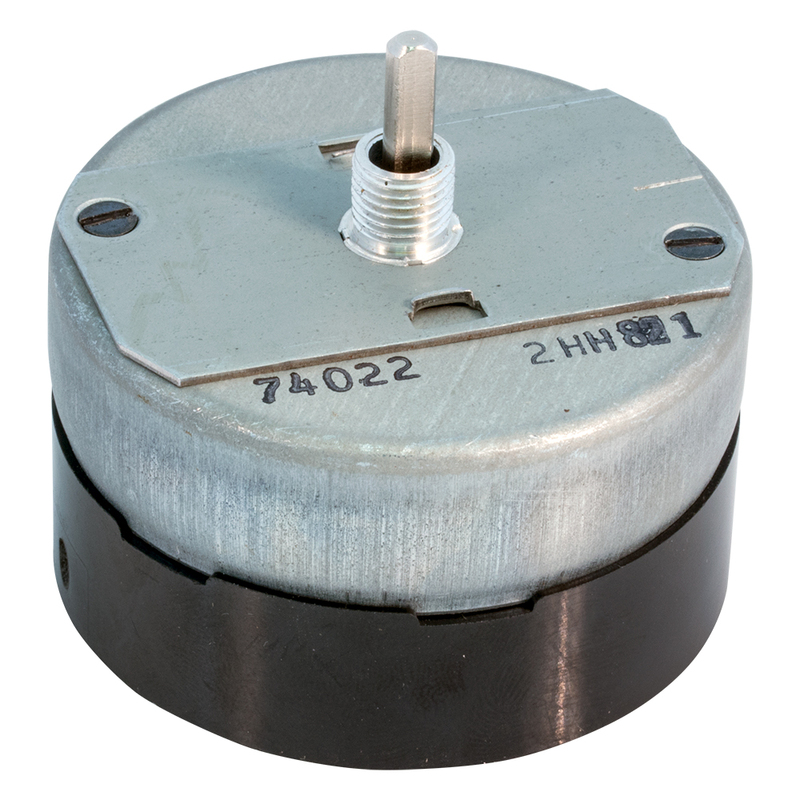 120v, 60 Hz motor. 24 hour clock with one "ON" and one "OFF" set points. NOTE: Box was wet. Internal steel plate has some rust. Clock 100% functional. Otherwise, new in box. General Time mechanical timer. 0.5 to 4.3 minutes. 15 amp, 250v AC. 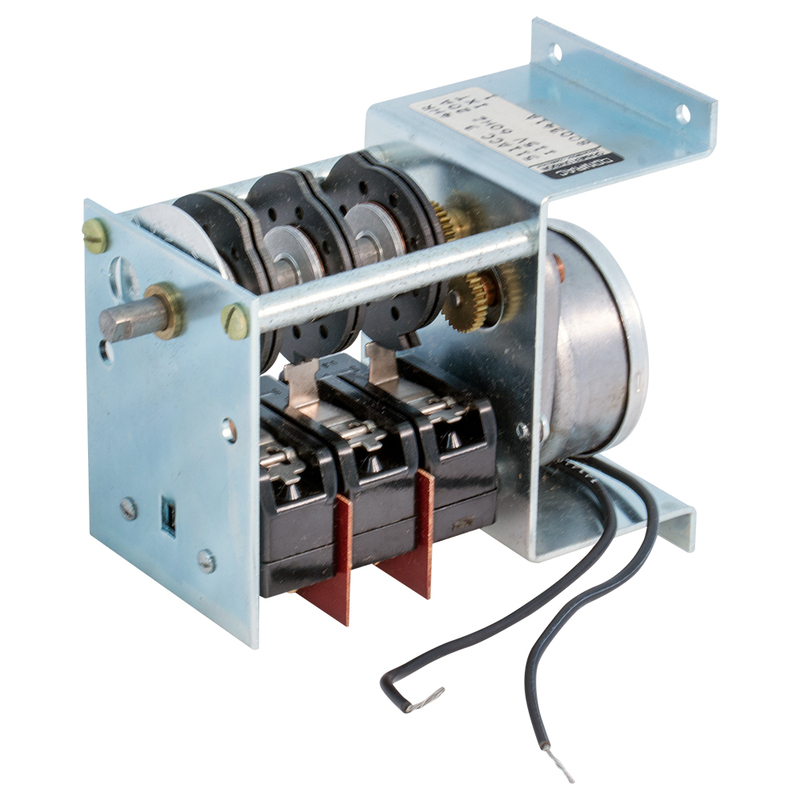 120v AC, 60 Hz motor. Red button is an emergency stop of the time sequence. Black button is a manual reset. Timer is manually set for trip time from 0.5 - 4.3 minutes. If power is dropped, timer picks up when power is restored. 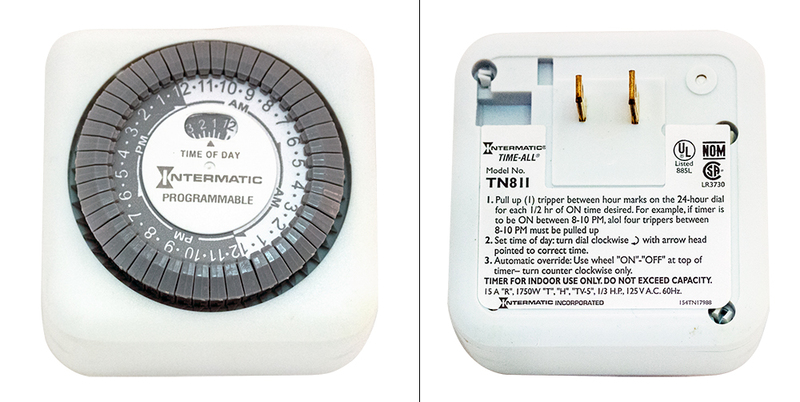 Mark 2 hour mechanical timer switch. SPDT, 20 amp, 240v switch. 1 full turn = 2 hours, 1/2 turn < 1 hour, etc. Electrical terminals 10-32 thread. 2-1/2" diameter x 1-1/2" deep. 3/8" bushing mount. 0.181" x 0.126" double flat shaft. Great building block for appliance, (crock pot) timer or ?. UL listed. Omron motor driven timer. 110v AC @ 60Hz, 100v AC @ 50Hz control. 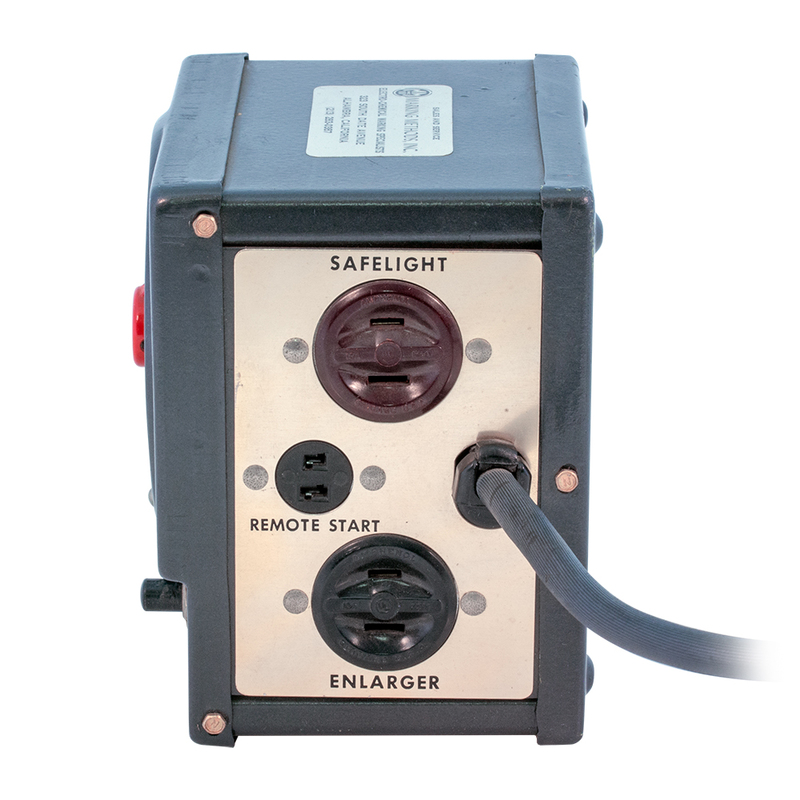 Instantaneous contact: SPST, normally open, 2 amps, 250v AC. Adjustable 0 to 6 minutes. Contact closes when preset time is reached. Includes adapter and 1/4" spade connectors. 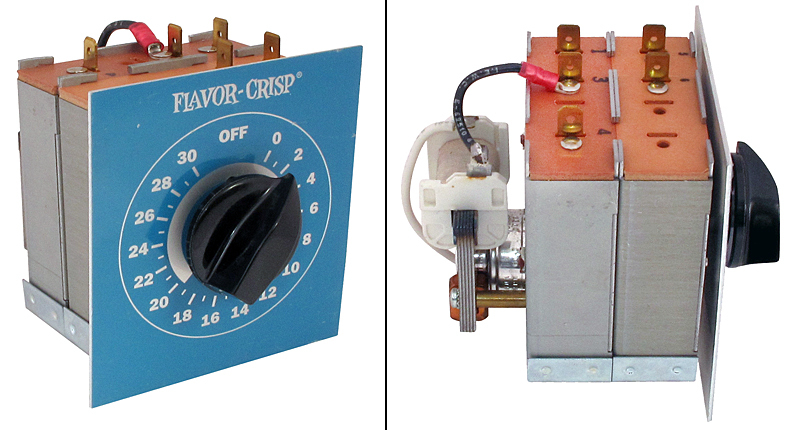 Flavor-Crisp motorized timer. 0 - 30 minutes. Made by Deltrol. Controls: 240 vac. Timing motor up to 6.5 amps. 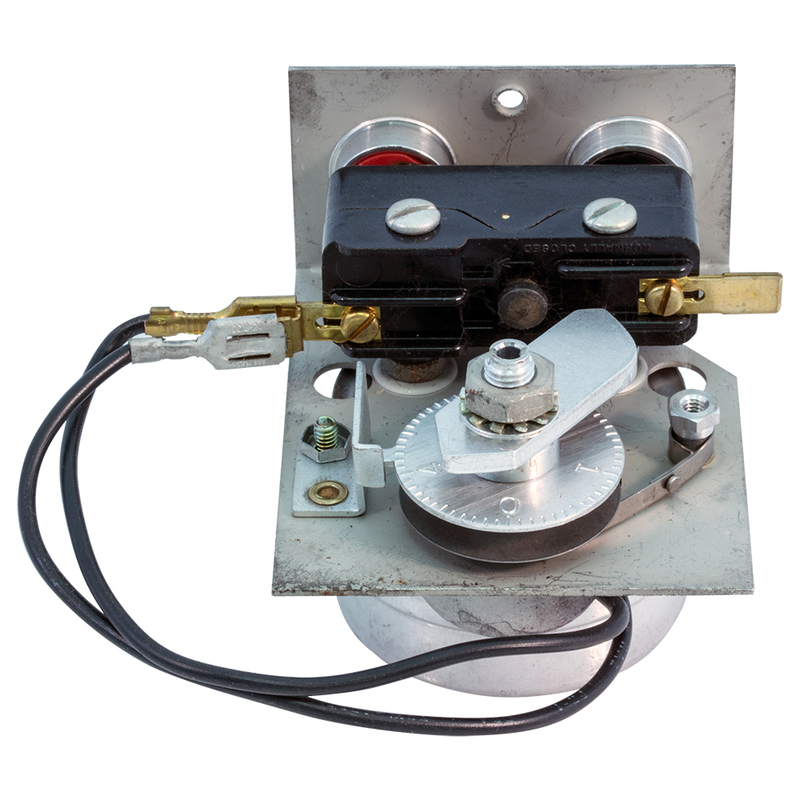 Wind timer to desired point and contacts close - opens when time runs out. Spade terminals normally open. Contacts rated at 15 amps 240v. 1/4" shaft. 2-1/4"D, 1-1/2" behind panel. 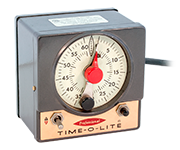 Ballantyne timer box contains an Omron H3G-8C timer and four 0.5 ohm, 50 watt Dale resistors. 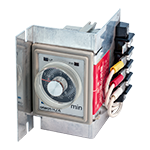 Plug in timer relay has DPDT, 5 amp contact rating and 120 vac control voltage plus nice octal hard wire base. Dial in any time between 0-5 seconds. 4" high x 5" x 6" Bud CU-729 box with removable top and bottom. Truly a mechanical wonder from the pre-transistor days. Energize the event coil (shown left) 4 times (115 vac) and on the 4th, 30 amp DPDT contacts are made. If the event coil is tripped more than 4 times, nothing happens. The release coil (shown right) resets the cam to zero, with contacts also resetting. 5" x 7" x 3-1/2" high. Motor driven time delay in hermetically sealed chamber. Preset 20 minute delay on operate. 7 amp SPDT contacts. 115 vac control circuit. 4-3/8" x 2-1/4" x 5" high. 8/32 bottom studs. Motor driven time delay in hermetically sealed chamber. Preset 2 second delay on operate. 5 amp SPDT contacts. 115 vac control circuit. 4" x 3-3/4" x 3-3/8" high. 1/4" bottom studs.